These steps show how to simulate an X.509 device on your development machine running Windows OS, and use a Python code sample to connect this simulated device with the Device Provisioning Service and your IoT hub. Open a command prompt or Git Bash. Clone the GitHub repo for device simulation code sample. Run the following command to create the Visual Studio solution for the provisioning client. Self-signed certificates are for testing only, and should not be used in production. The default expiration date for a self-signed certificate is one year. 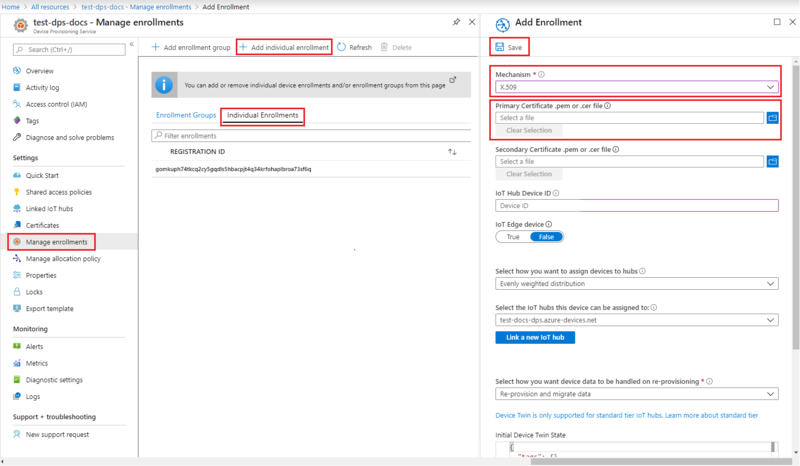 You will use sample code from the Azure IoT C SDK to create the certificate to be used with the individual enrollment entry for the simulated device. 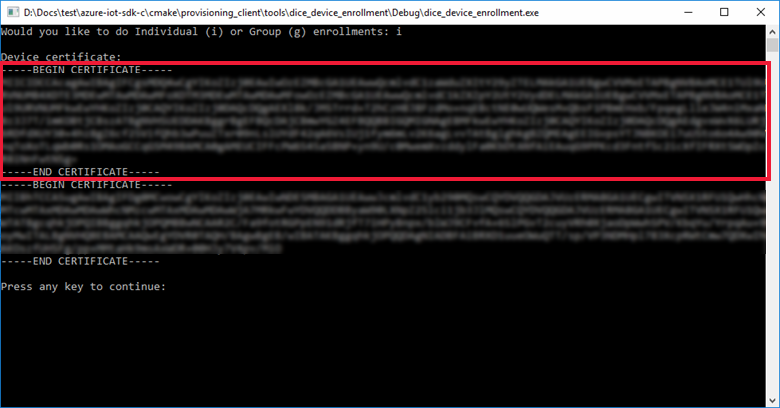 Right-click the dice_device_enrollment project under the Provision_Tools folder, and select Set as Startup Project. Run the solution. In the output window, enter i for individual enrollment when prompted. The output window displays a locally generated X.509 certificate for your simulated device. Make sure to include both of those lines as well. Create a file named X509testcertificate.pem on your Windows machine, open it in an editor of your choice, and copy the clipboard contents to this file. Save the file. Sign in to the Azure portal, click on the All resources button on the left-hand menu and open your provisioning service. Select X.509 as the identity attestation Mechanism. Under the Primary certificate .pem or .cer file, click Select a file to select the certificate file X509testcertificate.pem created in the previous steps. Upon successful enrollment, your X.509 device appears as riot-device-cert under the Registration ID column in the Individual Enrollments tab. 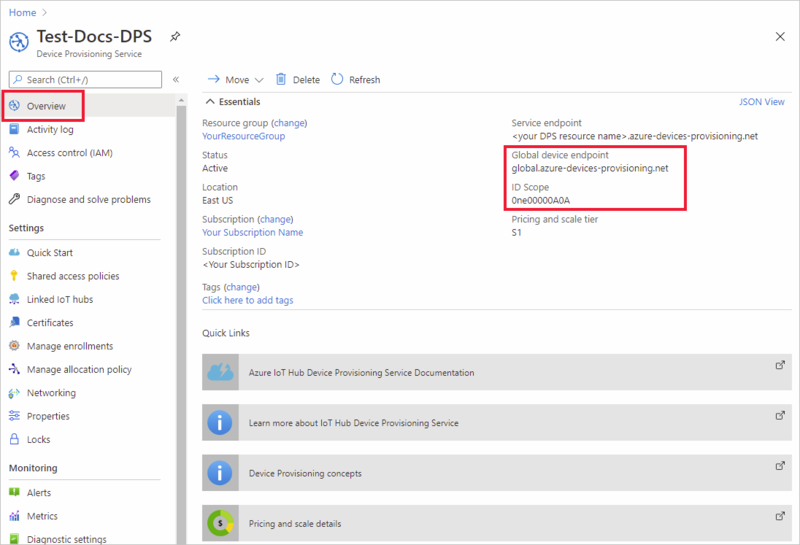 On the Device Provisioning Service summary blade, select Overview. Note your ID Scope and Global Service Endpoint. Download and install Python 2.x or 3.x. Make sure to use the 32-bit or 64-bit installation as required by your setup. When prompted during the installation, make sure to add Python to your platform-specific environment variables. If you are using Python 2.x, you may need to install or upgrade pip, the Python package management system. If you are using Windows, also install the Visual C++ Redistributable for Visual Studio 2015. The pip packages require the redistributable in order to load/execute the C DLLs. If using pip make sure to also install the azure-iot-provisioning-device-client package. Using your Python IDE, edit the python script named provisioning_device_client_sample.py. Modify the GLOBAL_PROV_URI and ID_SCOPE variables to the values noted previously. The application will connect, enroll the device, and display a successful enrollment message. In the portal, navigate to the IoT hub linked to your provisioning service and open the Device Explorer blade. On successful provisioning of the simulated X.509 device to the hub, its device ID appears on the Device Explorer blade, with STATUS as enabled. You might need to click the Refresh button at the top if you already opened the blade prior to running the sample device application. If you changed the initial device twin state from the default value in the enrollment entry for your device, it can pull the desired twin state from the hub and act accordingly. For more information, see Understand and use device twins in IoT Hub. 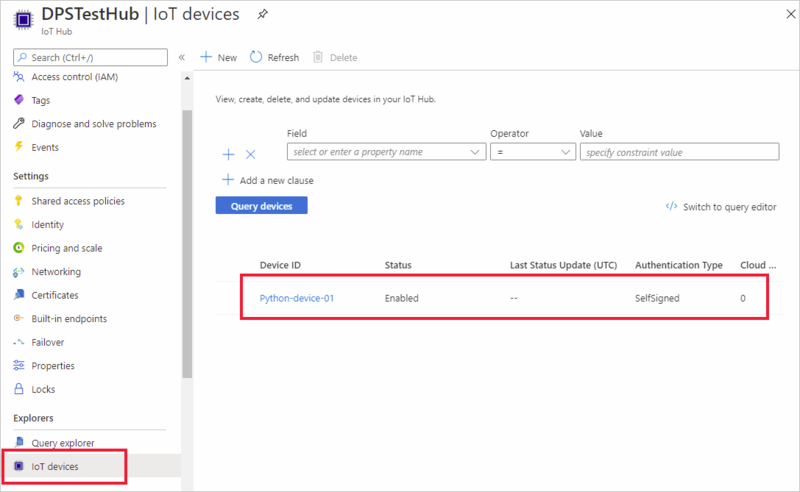 In this Quickstart, you’ve created a simulated X.509 device on your Windows machine and provisioned it to your IoT hub using the Azure IoT Hub Device Provisioning Service on the portal. To learn how to enroll your X.509 device programmatically, continue to the Quickstart for programmatic enrollment of X.509 devices.